No, I didn’t hold down the shift key for too long. 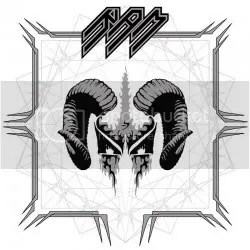 The band’s name is RAM, not Ram, and they’re a Swedish metal act that plays primarily in the traditional/”classic” heavy metal style (with a cool old school band logo to boot) and occasionally thrash creeps in. The inspirations are the usual for a band that plays this style: Priest, Mercyful Fate, Maiden, Metallica, etc. The Mercyful Fate influence is obvious just by vocals alone. Oscar Carlquist displays a number of vocal ranges throughout the album, most notable being the shrieking style of King Diamond. Unfortunately, he also sometimes resorts to the metal growling that I hate, but thankfully those moments are brief and do not dominate the songs. Despite the old school mentality of these straight forward heavy metal numbers, I hate to call this band a “retro” act. In fact, I hate to call any band a retro band. I’ve seen some reviews online knocking this band and the album just because it isn’t modern metal. So what! As long as the music is good, who cares ?!? Why does any genre or style of music have to be pinned down to a specific decade? “Awakening The Chimaera” is the song I was primarily referring to when it comes the growling. It’s actually a good song but it loses all momentum for me in the middle of the song when Oscar starts singing that way. Yuck! Luckily, “Lightbringer” and “In Victory” (which as a good groove) are right before it and the epic “Suomussalmi (The Few Of Iron)” isn’t too far behind it. I have to agree with the general consensus that it’s the best song of the bunch. I manages to sound traditional and fresh. “Titan” would be my second favorite song. It’s 100% pure straight ahead heavy metal as is “Blood God”. Either of those two songs could have easily come off an ’80s metal album. “Crushing The Drawf Of Ignorance” (which is a pretty cool title!) is the intro and “Prelude To Death” the outro. Intros/outros don’t really mean all that much but they are fine for what they are. Really, the only song that lacks “oomph” is “Ghost Pilot (MI II)”. Total filler on an otherwise very good album. From what I can tell, the album was originally released in June 2009 but AFM rereleased it in June 2010 with a slightly altered cover. Well worth the pick up for traditional metalheads.